Even for those of us who aren’t designers or typographers, a company’s corporate font seems to seep deep into our consciousness. I mean, yeah, that’s what it’s meant to do, so it shouldn’t come as a surprise, but the extent to which we’ve internalized the slight and esoteric differences in the shapes of letters and assigned them to individual companies can sometimes be surprising. Let’s try an experiment, using Apple’s old corporate font, a specialized cut of a condensed weight of the famous Garamond typeface. Yeah, those ain’t working; they just look like words written out rather than logos. Even in the case of Google, whose corporate font—with that distinctive double-story lowercase G—is the closest to Apple’s, your brain knows there’s something wrong. But set a few of the product names from the era of Apple Garamond using it, and ahhhh, that just feels right. 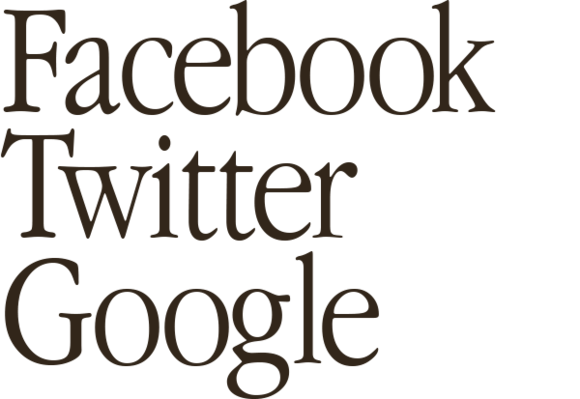 For sure, to a modern eye this fussy, pernickety Garalde serif face looks needlessly frilly and ornamented. The contrast in stroke width makes it sizzle and buzz, and little details like how the 6 isn’t closed make you want to grab its designers by the lapels and tell them just to calm the hell down. 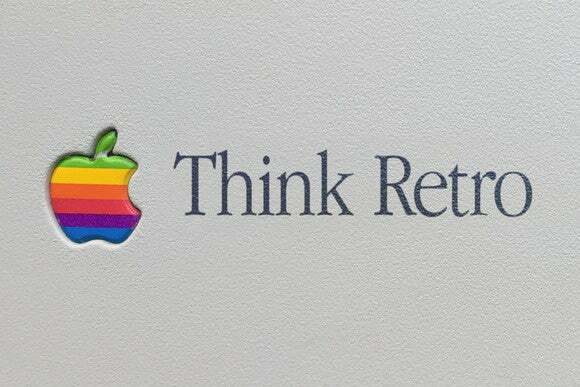 But for those Mac users among us of a certain vintage, we still mourn the passing of Apple Garamond. Like the original logo, it was a quick visual shortcut which seemed to embody everything about Apple—elegance, class, design—that made us yearn for these products. Apple Garamond was everywhere, from Apple’s marketing materials, to its nascent website, to the products and their packaging themselves. Setting names in the wrong font works just as badly in reverse, too. 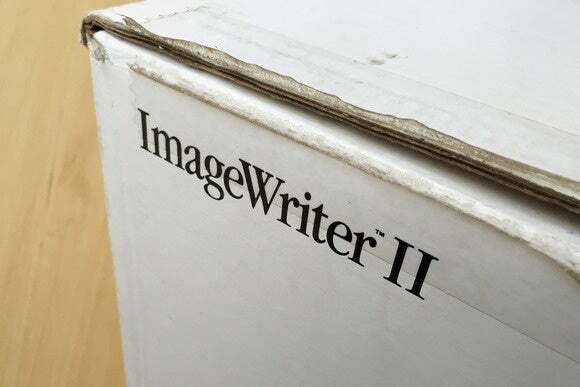 In 2002, Apple started using a variant of the Myriad font family, and while “ImageWriter II” just looks right and proper in Apple Garamond, above, setting it in Myriad Pro just looks all wrong. Although Garamond and Myriad are the two fonts most associated with Apple, of course there are many others. Chicago, for one, the originally bitmap face designed by one of my all-time design heroes, Susan Kare, as well as Lucida Grande (used from Mac OS X’s inception up to Mavericks), and even Mac OS 8 and 9’s Charcoal. 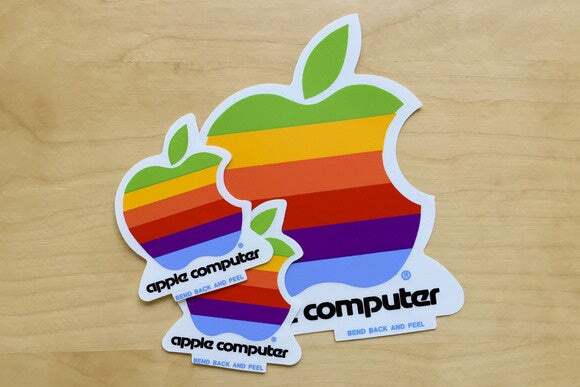 Incidentally, the smaller size of that old logo sticker fits perfectly over the glowing Apple logo on some Apple laptops, and it looks terrific. I know because I had one on my old iBook; I’ve checked it against my 15-inch MacBook Pro (whose logo is too big for the sticker) and an 11-inch MacBook Air (perfect!) so if you keep an eye out on eBay you might be able to do a quick retro hack on your laptop! What font links Apple and Volkswagen, and how? What is the name of Apple’s newest font (to be used in a product which is still unreleased as I write), and why is that name familiar to old-school Mac users? What font is shown on this iPod’s screen, and why might that be a bit of a trick question? What links the father of modern science with an English sculptor? (This one is an unapologetic font nerd question, only tangentially related to Apple, but screw it; I think Frutiger’s system is interesting!) Beginning in 1984 with the Apple IIc, the font used on early Apple keyboards was Univers 57; what does the 57 signify?